Baby Boomers have been changing the game since the day they were born, and with every milestone they passed. They have demanded newer, better, and more all their lives, and as they move into their senior years, they aren’t settling. Technology is a perfect example, because they’re forcing the world to do better yet again, and seniors of all ages are benefiting from the pressure they exert. We’re giving caregivers, home care aides and loved ones a preview of the smart technology on the way for seniors. 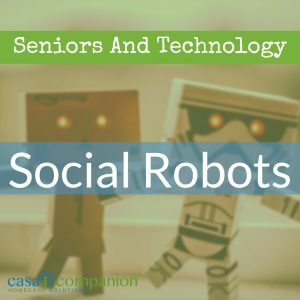 The new crop of senior technology for 2018 includes interactive smart cameras, wearable activity tracking devices, and wireless hearing aid ear buds, but social robots are the big story. Social robots are basically Alexa-style smart speakers with ‘faces’ and moveable parts that mimic human expression. Not quite Rosie from the Jetsons, but easier for seniors to use than the formal and oddly specific Alexa, who requires excellent enunciation and formally-phrased requests. Also called personal assistants or robot assistants, these devices have larger screens, ‘body’ language with lights, closed captioning, vocal and facial recognition, and varying levels of Artificial Intelligence (AI). One new device from France, the Buddy, looks like a small, sitting dog with a tablet screen for a face, wheels, and a moveable ‘head’. Another device, called ElliQ, doesn’t look human or animal, which is deliberate. Its two parts are a tablet screen and a head-like speaker that moves, and its AI is meant to be more proactive than current smart speakers Alexa or Google Home. Another new device from France, called Cutii, is surely meant to be person-like, as it has a body, wheels and a tablet ‘face’ – plus a bow-tie in the colors of the French flag. Do these devices have a future? Only 26 percent of those over 65 considered themselves ‘very confident’ in using smartphones, tablets and computers, per the latest study from Pew Research. While the rate of seniors who own a smart device is growing, this still leaves a huge cohort of seniors who either don’t use technology at all or can’t integrate it into their lives. It’s frustrating for Grammy to hear “Why don’t you just take a picture and text it to me?” or “Your granddaughter wants to Facetime with you,” when it’s too difficult to remember the function of all the icons, and the screen locks up while she’s staring at them. The easy flow of ideas, pictures, and words we all take for granted is a little confusing and out of reach for many seniors – and even younger Boomers have moments of awkwardness with technology undreamt-of in their youth. Why does Silicon Valley want to develop technology that can serve the huge senior market despite the small role technology currently plays in their lives? Because the number of Americans over 65 will double in the next three decades. Caregivers and loved ones will agree that there is no substitute for human interaction, love, and care. But for the many seniors who live alone, far from family or in good physical health, a social robot that connects them to the outside world could be a game changer. And if they can connect themselves to the WiFi, and set up the router to boot, we’ll all want one!